the day of Chase’s fourteenth birthday. Despite his problems, his biggest concern is that his family’s Dark Enemy, the Marlowe Family, is becoming more powerful with each passing day, fueled by the energy they continue to pillage from the many magical beings of the world. If Chase and his family are ever going to win, they will need a whole lot of magical help. They must destroy the most evil threat the world has ever known! Hey creative minds! I’m here to introduce you to a new app called MixBit. Now, If you’ve been to the app store you know there are millions of different apps and there are a lot of people forcing their apps on you, but MixBit is an app worth having. I’ve never been a person that has all the latest apps. I usually go to the app store, get what I need and get out. No playing around to see what’s out there. My sister is big on apps. Her iphone is full of apps for different uses and even with my friends I feel like I’m lacking in the app arena. So, I said when I have the time I will actually take a look at these apps. I was on my ipad which searches both iphone and Ipad apps. I came across MixBit. – If the creators of Youtube are coming up with a new app, it’s definitely worth checking out. – Keyword there is together. I don’t know what it is, but I like to be connected. I like to make a connection with other people. I also believe that many brains are better than one. The possibilities seem endless. 3) The Mixbit website lets users collaborate with each other and remix videos uploaded by the community. Visitors to MixBit.com can make their own videos without shooting original content by remixing video clips they find on the site. -Collaborate is another keyword for me. As well as being able to create new videos without shooting original context. There are some people who are more about telling a story than actually filming the stories. So, I downloaded the app and started to really have some fun. First video is called Being Healthy? Which features my face a lot. These other two have been created using other content found on the website. I have made a few more videos on there, but I think you get the picture from these. As an author and writer as many of my blog followers are, this app is a very straight forward thing. As a writer I know that stories have a beginning, middle and an end. That is the exact same with remixes on MixBit. You take any clips you want and tell a story. For me this is so much fun. I think it’s probably too much fun for me right now. I feel that many people on MixBit right now aren’t sure what it is they are supposed to be doing. They’re treating MixBit like any other video sharing app. Right now when I make a MixBit remix video I try to include a lot of clips to include a lot of users. Why? I want to show people the potential their clips have and what they could do with a simple video about sipping coffee or whatever it may be. If you feel that MixBit is just like any other video app then you’re doing it wrong. MixBit takes short clip creation like Vine & Instagram and remixes it to where you could create hours on one video with the help of people worldwide. Don’t be nervous about creating your first video. I was definitely nervous about making my first remix, but you have to just go for it. Once you start searching for clips, placing them together and watching the final product you will enjoy yourself. You will start to see why I have fallen in love with this app. This is a very new app right now, so I’m sure there will be changes and/or upgrades, in the end all I can say is MixBit is beautiful. A powerful demon has been trapped under the city of London for over 300 years. Now, however, malevolent forces are at work in the 17th century, planning to unleash terror and chaos on the world. Two rival secret societies the Liberati and the Praesidum – are caught in a battle that threatens to destroy the city and its unknowing inhabitants. When a truant schoolboy, Ben, finds a scroll revealing the location of magical seals that bind the demon, this throws him into the centre of a dangerous plot that leads to the Great Fire of London. Ben must overcome his own problems – fear of failure, desire for revenge, guilt over his parents deaths – if he is to protect the city, and confront the evil demon. As the plot unfolds, a little more of the mystery about Ben s own past and his parents deaths is made known. Ultimately, Ben and his friends must combat sorcery, defeat the evil Liberati and destroy the demon if they are to save their city and themselves. 1. Pacific Rim is perfectly amazing. 2. Pacific Rim gets right into the heart of the story. 3. The cast was picked perfectly for each part. 6. The music wasn’t the normal Transformers/ Inception music. 12. We are very far into the future in this movie and yet, there’s still paper & chalkboards being used. Are You A Writer OR Something Else? Are you just a writer or are you something else? I was hanging with some friends and they were explaining to this young kid that I was a writer. The kid happened to be playing with crayons and started to write on a piece of paper. “I’m a writer now too.” he said. They laughed and told him that I write a lot more words than that. So, he started to write all the words that he knew. I laughed because it was true. He was a writer, but I was something different from JUST a writer. It made me think everyone is a writer. Students writing essays are writers. Even though they hate their entire lives while writing them. Everyone and anyone can be a writer by definition. But, I’m different, right? Maybe it’s my human way of wanting to feel special or unique or whatever, but I must have another title that’s more appropriate. Again I was talking to this girl, who has written a book and hasn’t published it yet. She’s like I’m trying to be an author, but I have yet to publish the book that I have written. Then, she quickly corrected herself and said, Yes! I am an author! An author is a composer of a literary work. So, yes, she is an author and I am an author whether I have published or not. I feel that a lot of people think they have to be published to be an author or have written something extremely long. You are an author with your story that’s 10 pages. You are an author if you’ve written 230 pages and you hate all of them. 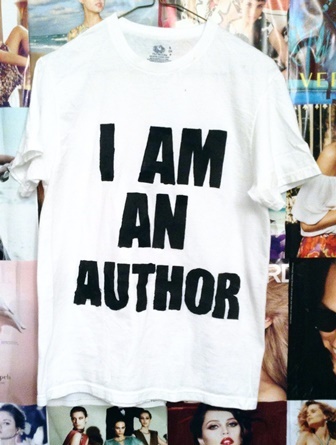 Does book sales or publishing make you a proper author? I have no idea how I feel about that, but I think that as authors we should celebrate every accomplishment we make. Writing is hard for some and easy for others. So, you finally finished 100 pages that’s a celebration. You’ve finished your first book. It’s a celebration. You’ve figured out your characters and plot and the ending, it’s a celebration. Prompt: You can speak to fish. The main character is a guy who is a lifeguard for a beach. He is a typical surfer guy with sun died blonde hair, perfect tan, and muscles. He wakes up one morning in the lifeguard shack as he always does. He is half awake stumbling around getting dressed and fixing something to eat. Then, he comes to his fish tank where he feeds his fish. Then, the fish starts to talk, “I hate these stupid dry flakes you give me.” The fish has an attitude, if you hadn’t noticed. The lifeguard can hear the fish and he’s looking around like did you just speak to me? The fish can’t believe that the guy can understand him. The fish is just like, “This guy is going crazy.” The guy starts having a conversation with the fish asking how this happened and how can he understand the fish. The lifeguard is freaking out trying to pinch himself and sticks his hand in the grease of the bacon that he was making for breakfast when he realizes that this is real. As he is trying to figure out what’s happening there’s a siren about a shark being in the water. He goes out to search and make sure the water is clear. When he gets out in the water he and the shark start having a conversation, but the people in the shore think that he is being attacked. His lifeguard buddy comes jumping into the water to get him out. The guy starts getting really angry because he was in the middle of a conversation and his buddy is confused because he thinks he saw his friend trying to talk to the shark. The guy tells his buddy to leave him alone. The guy goes back to his shack where he and his fish start talking and because he’s breakfast is ruined and his buddy is here he decides to take the fish in a cup with him to a diner on the boardwalk. He is trying to talk to the fish while people stare at him to figure out why he can talk to fish and why he can talk to them now. Cigarette Suicides is my 11th book. Here I’m sharing with you the first chapter. Links for the book are after this! A cigarette was the only thing ever given to me. Wasn’t given a mother to hug or even a father to play ball with. Just a foster mother with a bad habit of overflowing her liver and mixing medicines. Miss Foster Mama was old. She must’ve been pushing 60 plus. She had been a looker in her youth. Blonde hair with deep waves and sky blue eyes. A true southern bell, but she had move to the city where the action was. Miss. Foster Mama had seen a lot of action and that had made her tougher than most, but also pass up marriage and child bearing. I think that’s why she decided to be a foster parent. She could have kids without actually having to have them. She told us to call her Miss. Foster Mama. Partially because that’s who she was to us and names wouldn’t matter after we were truly adopted, but more so other people could know what service she was doing. I believe in the beginning she really enjoyed it. She really wanted to care for the kids, but not every kid accepted her. I could tell she was coming to the end of her fostering years. She didn’t move around as quick, but she would still put on an old song and swing her hips as well as have boys over for rounds of poker. The kid who had been with her the longest would serve her and her friends during the poker game. The younger kids were always getting adopted, but as the years went by even the older ones started to get picked. I was still there. It’s not like I sat there hanging my head over it. I knew why I wasn’t being picked. I wasn’t interested. I didn’t want to go to any old family. Unlike dogs I could speak when someone chose me from the pin. So, my first night I was real nervous about serving and Miss Foster Mama liked to practice tough love. She came over to the table and I sat there not saying a word. “Don’t lie to me.” She said flipping out her switch blade. Oh, yeah. She carried a switchblade. She had one for each of her handbags. She never used them on the kids. It might have been a cruel joke, but it didn’t scare me. I still did what she said when she pulled it out. I wasn’t gonna be the first kid she used it on. I told her I was nervous about being around her friends. She smiled at me while opening a bottle of Brandy. She poured a gulps worth in a small paper cup and handed it to me. I frowned and pushed it back. “I’ll open your mouth and pour it down.” She said sternly. I grabbed the cup and drank it. I was eleven then. The drink went straight to my head. When I saw her rather large male friends come in I was nervous again, but she shook me out of it with her scream. Miss. Foster Mama liked to scream. I hated screaming especially hers and especially because the table was only 5 steps from the poker table. After a couple drink orders I wasn’t nervous anymore. Foster Mama drank straight Brandy. Her friends liked either Brandy or Beer, but after a while they didn’t care what it was as long as it made them forget about losing money to Foster Mama. It was three years later when Miss. Foster Mama had her first seizure. The boys had been too drunk to notice her having a seizure. I knew what was happening and I sprang into action. I ran to call for help, but Lee stopped me. Lee was a regular at poker night and any other time of day. He wasn’t tall and his beer belly was obvious. He was always wearing jeans stained by dirt, paint and probably more. He’s shirt had the same stains. His face was dark with hair that was never combed and thinning. Lee said Foster Mama would kill me if I had called the police. Ambulances were the chariots rich people took to the hospital. Foster Mama didn’t have the money for that. He and I grabbed her up and put her in the back of his white van wrapped in blankets. I had started to get twitchy with nervousness as we came up to the emergency room. They wheeled her off and Lee and I sat in the waiting area. Lee had made himself at home. Drinking a beer he brought and eating Cheetos from the vending machine. He tried to comfort me by patting my arm, but his fingers were covered in Cheeto dust instead he pounded my shoulder with his palm. I wasn’t comfortable being in here and I seemed to be the only one that was worried about Miss. Foster Mama having a seizure. I went outside to get some air. It wasn’t cold, but I couldn’t stop shaking. There was a nurse outside and she was clearly wondering what was wrong with me. I was trying to act normal because she was pretty. Light brown hair, deep green eyes and lots of dark eye liner in purple scrubs. “You alright, man?” she asked. I nodded not sure whether to tell her who she really was. “Here take a drag.” She said holding out her cigarette. “Alright. I only say that cause it’ll help you calm down.” She said placing it back between her lips. I was confused, but I took it and inhaled quickly. I bent forward coughing. “Slowly, man.” She said concerned. I inhaled again and let the smoke flow out. I took it in one more time before passing it back. I did feel calmer. Maybe it was because I focused all my thoughts on the smoke. “They might not be good for you, but I’ve learned that most things that help you through a tough time aren’t always the best for you.” She winked. I wanted to savor it like the last piece of candy, but I also wanted to keep it like a sports memorabilia all locked up in a case. I was still shaky and when else would I get to smoke a cigarette. I smoked it slow as I continuously peeked over my shoulder to see if Lee was coming. I finished up, but realized I reeked of smoke. I decided if anything to tell the truth in hopes someone would buy me more. I pulled away and nodded. I never say I can see the future, but I know Miss. Foster Mama hadn’t seen the next two years the way they played out. Every couple of months she was in the hospital for something which meant Lee gave me a cigarette for each time she there. At the end of the year the state cut back on the amount of kids that stayed at her house. Soon after she died. Silly Lee had suggested I stay with him, but neither Miss. Foster Mama nor I wanted that to happen. Miss. Foster Mama’s Will had included me. I was happy to be included in her Will. I hadn’t loved her and I hadn’t come to think of her as anything close to a mom. Just a more caring dictating ruler. I think had I been one of her first kids at the beginning the bond would have been better, but there was still a small string of bonding. Miss. Foster Mama’s Will stated that I was not a state kid. She said I was a part of her family and I was to go stay with her younger brother Papy. As an orphan, all Catherine “Cat” Langtree ever wanted was a home of her own. But one thing always got in the way. Her ability to move things with her mind. So, when her adoptive father sends her away to New Haven, a boarding school half way across the country, it’s pretty clear that her dream is not going to come true. It doesn’t get any better when the most popular girl in school, Jennifer Talbott, decides to make her the prime target for bullying. Cat soon realizes she has more to fear than simply not fitting in. She can’t control the power that races through her. And when it comes out to slam a locker door in Jennifer’s face, she realizes that the danger isn’t just in being discovered…it’s in hurting someone. Everyone else thinks that it was an accident. But someone knows the truth. His name is David Grant. And he claims to want to help. As David and Cat get closer, the incidents begin to pile up threatening the new home she has quickly come to love. But David has secrets too. And when David takes Cat home to visit his family, she learns that she is not the only one who has this uncomfortable gift. Noah Grant, David’s older brother, has been struggling with the same power for years. Being discovered is not an option for Noah. It happened once when he was taken into a government branch who specializes in training people with certain gifts. Gifts that the government would like to use as weapons. He escaped, but his capture sent the entire family into hiding. When Cat discovers that Noah has the same power she does, she begs him to help her learn to control it. As Noah begins to help Cat understand and control her power, Cat realizes that her power isn’t the only danger they face. She’s getting close to Noah. Too close. And when David’s own terrible secret rises to the surface, she realizes that nothing is what it seems. But will Cat choose a life she knows with David or a life she can’t control with Noah? Is it a sick practical joke? Or an earnest threat? Who sent him the anonymous e-mail? Lee is about to marry Lucy. They only met six months ago. But in the gusts of this whirlwind romance, Lee has avoided telling Lucy about his past. That past is the stuff of nightmares – gangsters with grudges, an obsessive ex-wife, and a mysterious stranger who can provide the link to a murder investigation that went tragically wrong. Despite strange, recurring dreams, Lee’s approach has been to bury his head in the sand, pretending the past didn’t happen. But he can’t do that now. Twists and turns will cause Lee to question why he’s a police officer and whether he can go ahead and marry his perfect woman. Will Lee and Lucy have a future? Or will it be shot down by Lee’s past? ‘Vows To Kill’ is an intriguing, mysterious crime novel from the writer of the bestselling thriller, ‘Run, Run, Run’.